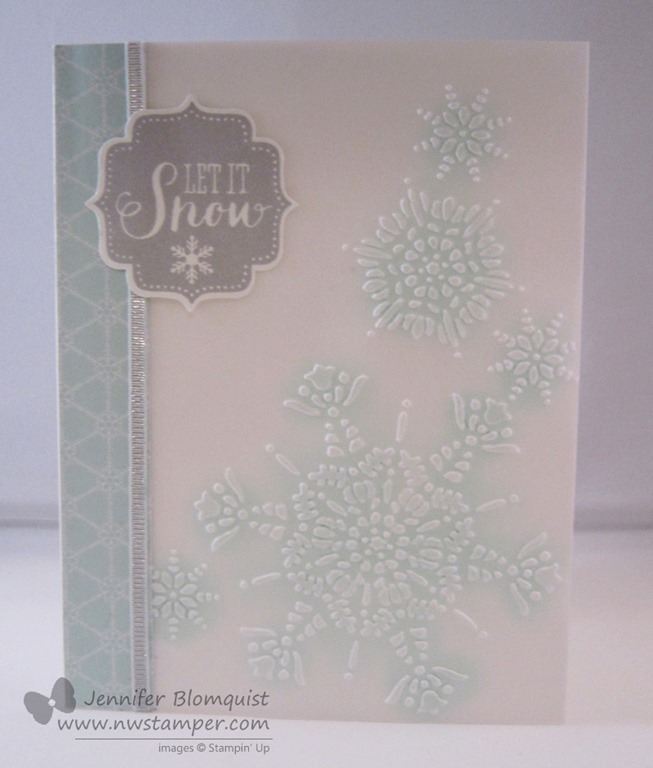 One of my favorite things that I love to do with vellum is run it through the BigShot because it makes the coolest bright white image over the frosted white of the vellum cardstock. 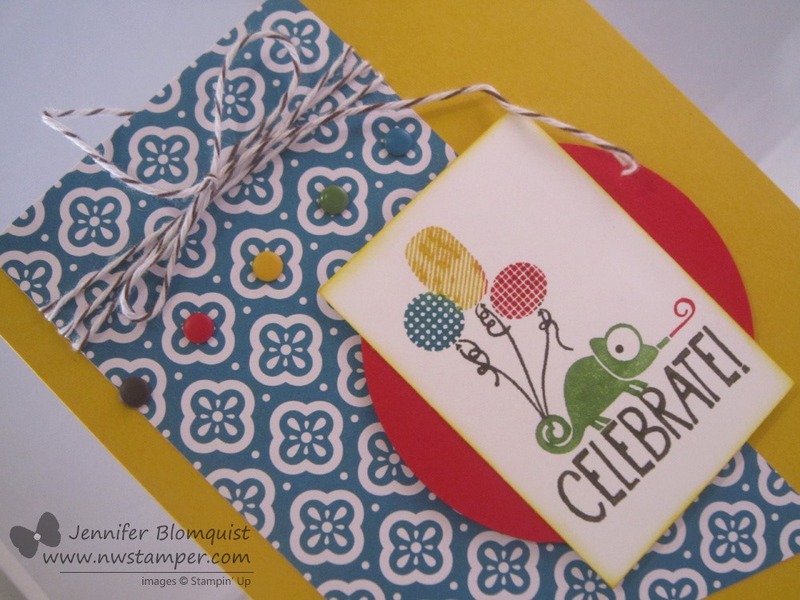 Then I love sponging on the back side of my embossed image to add a pop of color. 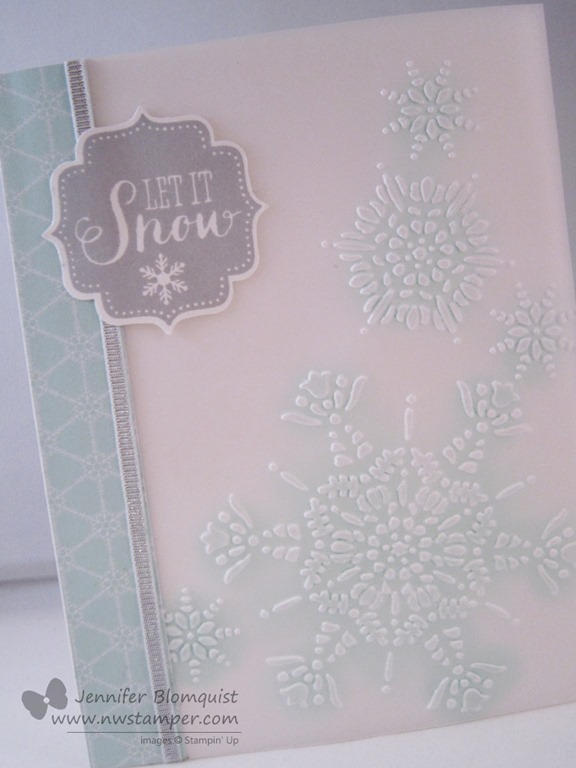 Turns out it is perfect for using with the Northern Flurries embossing folder for snowy snowflakes. 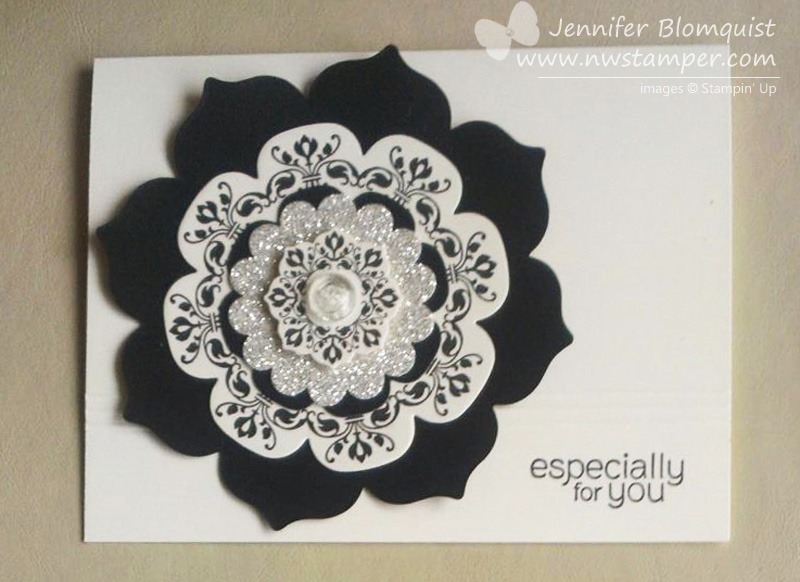 Though next time I think I would add a bit of glitter and sparkle to the front of the card for an extra magical touch! 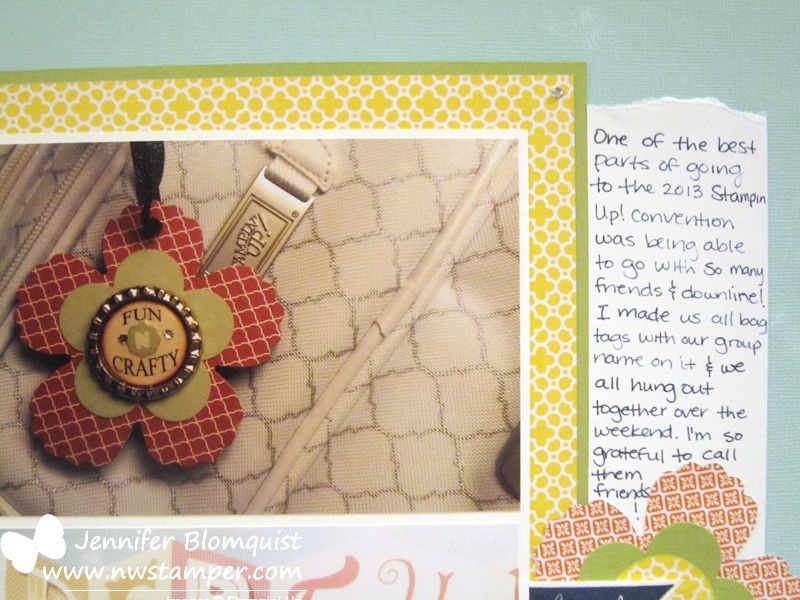 In this example, I attached a piece of embossed vellum to the top of a Whisper White cardbase with it only being adhered to the left edge of the card front. 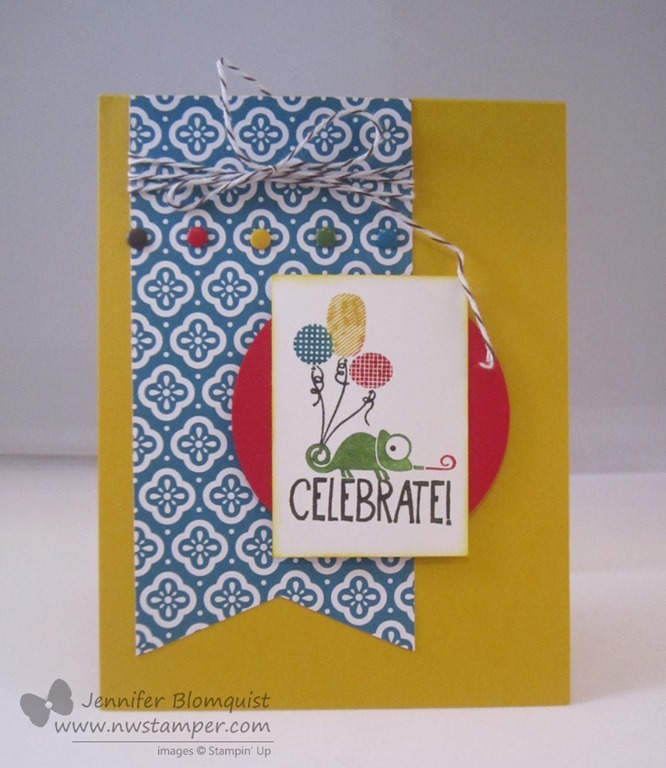 By only adhering it to one side, the vellum pops up just a little and gives you a softer look. So give it a try and let me know what you think! 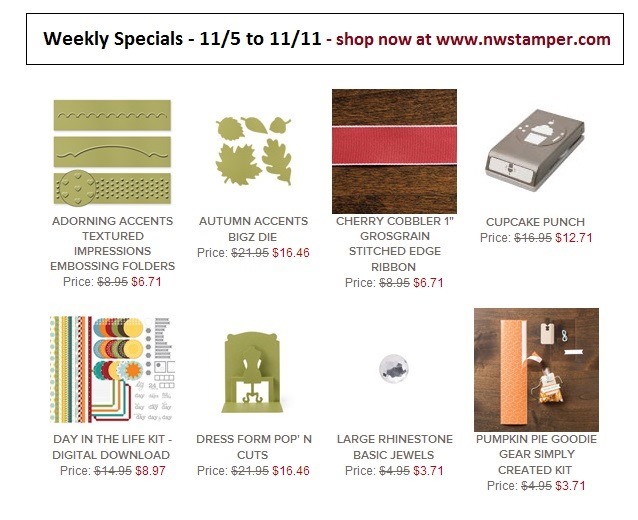 Elegant Glitter Floral Frames Card & Weekly Deals! 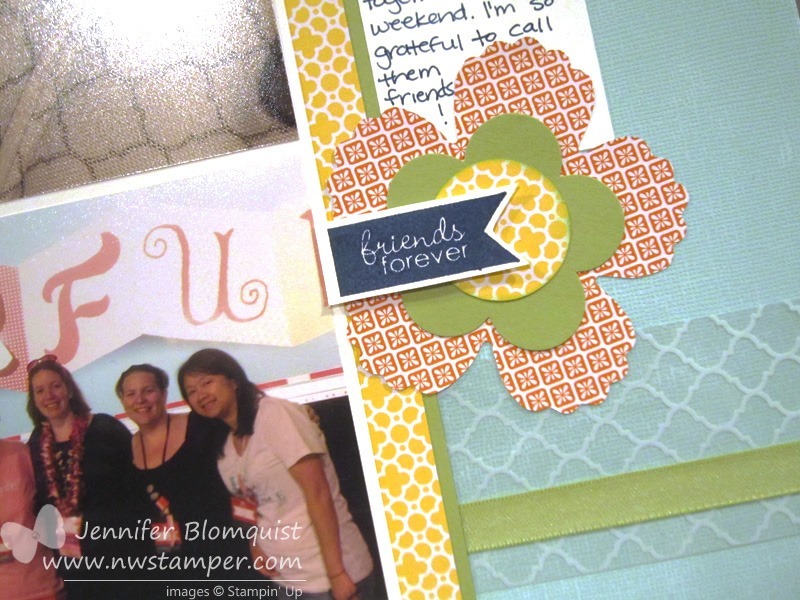 When I saw the weekly deals this morning, I thought it was so cool that Floral Frames framelits were on sale and it made me think of my favorite card I’ve made with these framelits. Wanna see? Sorry it isn’t the nicest picture, but it is what I had from when I made it a while back. 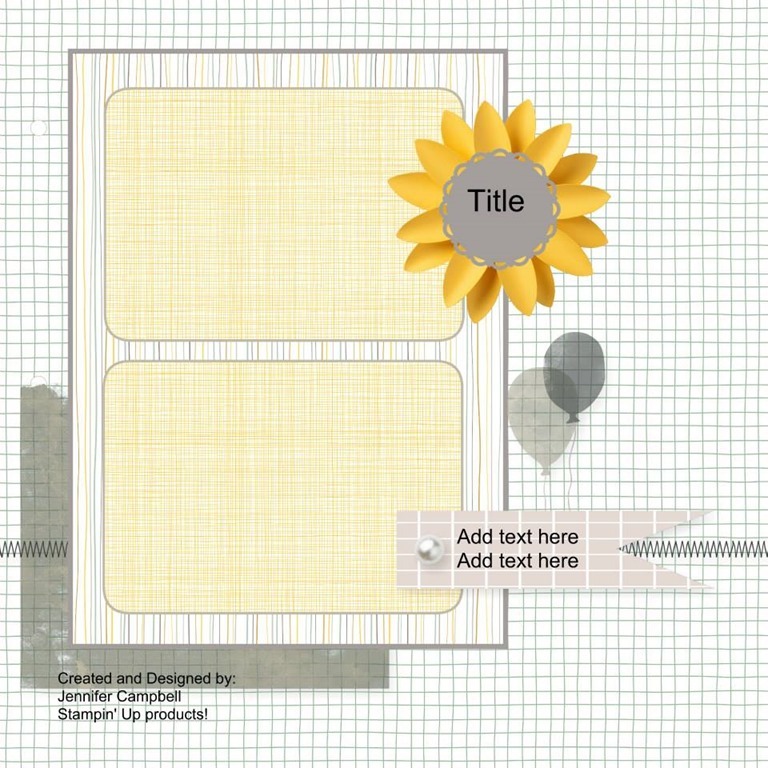 It is easy to make thanks to the different size flowers in the floral frames framelit set and when you use the coordinating Daydream Medallions stamp set it comes together in a snap. Use Hostess Code – VPESSGUJ when shopping and you will be entered to WIN a minimum of $25 in your choice of free benefits! We are about to enter “birthday season” here at my house with the first few starting up at the end of the month and then me and my two kids all have December birthdays… so it is about to get crazy here! 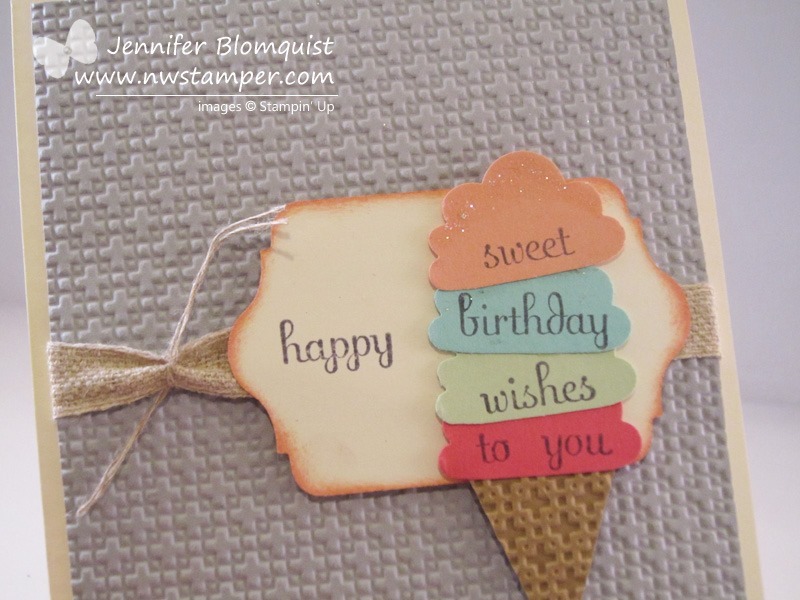 But one thing I always have to have for birthday is cake and ice cream… so what better way to say Happy Birthday than with some adorable ice cream on a card? So sweet! And it is really easy to make too! 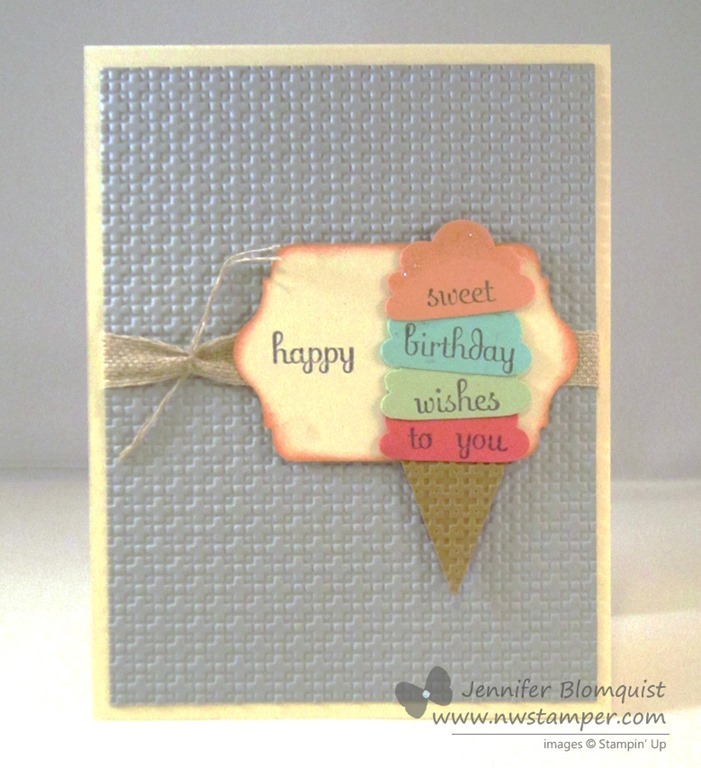 To make the ice cream cone, you just need a couple of punches and an embossing folder. 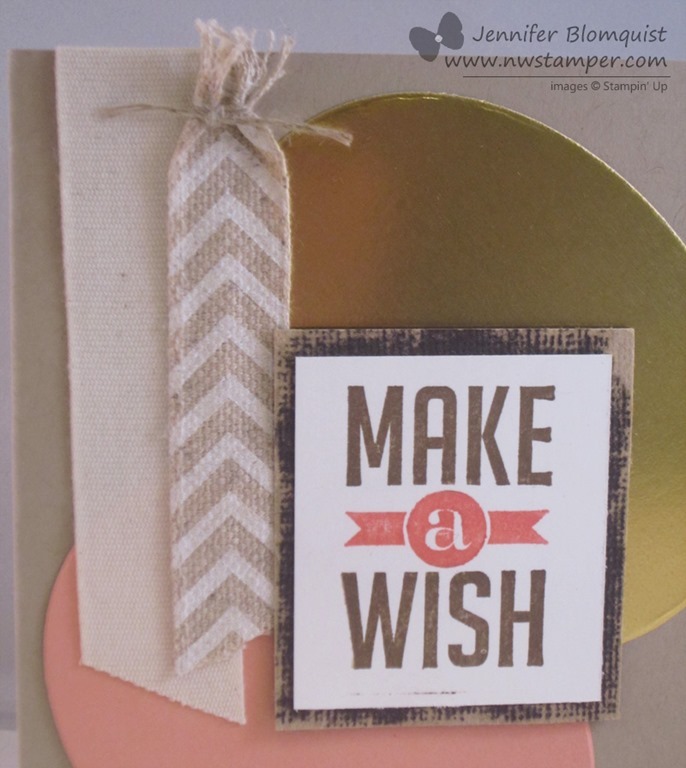 Make the ice cream cone by punching out a pennant from the Pennant Builder punch and then running it through the Big Shot using the Square Lattice embossing folder. Add some glitter to the top of your first scoop of ice cream and you have an adorable ice cream cone! 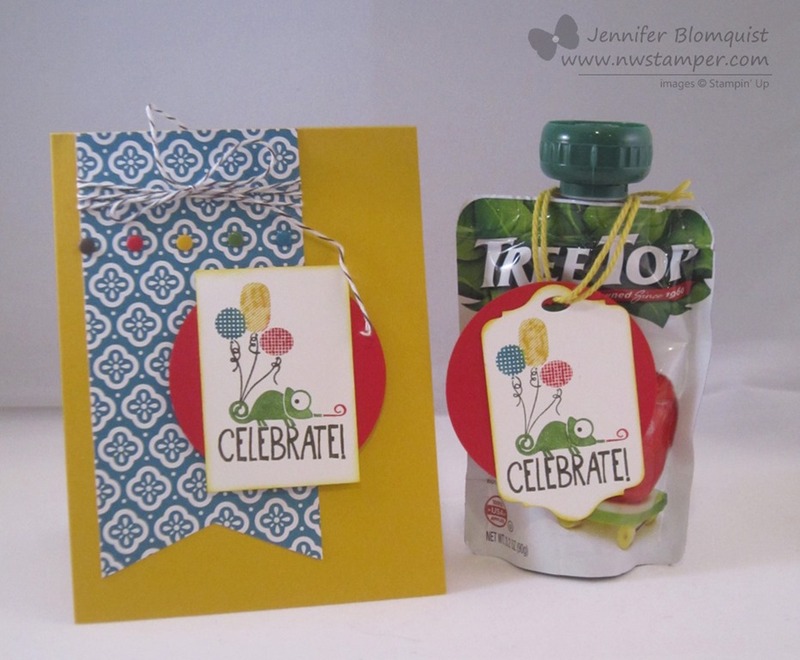 I layered the cone onto a tag made with the Chalk Talk framelits and sponged the edge with Crisp Cantaloupe ink. Ok, I have to admit…. I have something on my shelf that I was soooo excited to buy and then once I got it home, I kept staring at it but couldn’t quite get up the courage to try it out. Yes, it’s true – I’m talking about the Expressions Thinlits. Now, I saw them in the Holiday Catalog and was struck by how cute and whimsical they were (turns out “whimsical” is a word I have been using a lot lately to describe things I like). 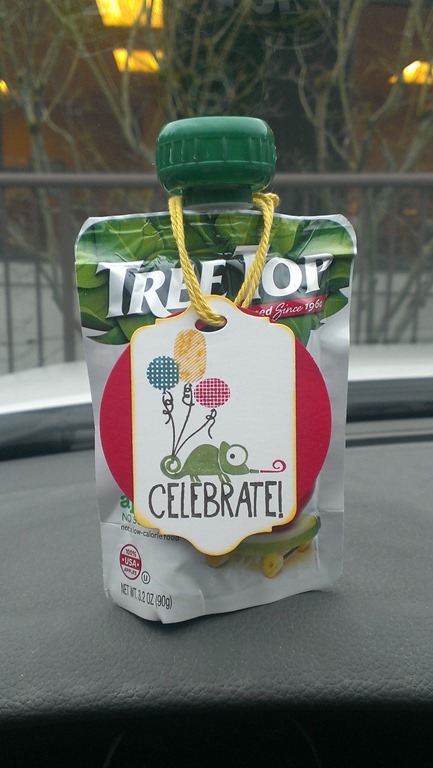 See….. aren’t they cool looking? But then I got them home and they went from whimsical… to dainty… to fragile in my mind and I kept not trying them out. But I finally decided to give them a go, and guess what? They weren’t as bad as I thought… in fact, I wish I hadn’t waited so long to play with them! 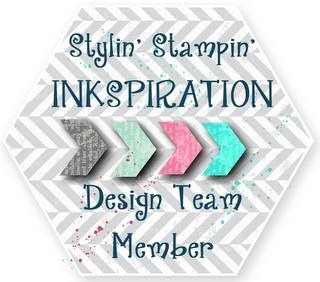 I started out with a rectangle piece of the Sweater Weather designer paper that I cut into pieces and then stamped with the Magnificent Maple stamp (though I guess it would have been easier to stamp first and then cut into pieces, but I wasn’t thinking that far ahead! ) 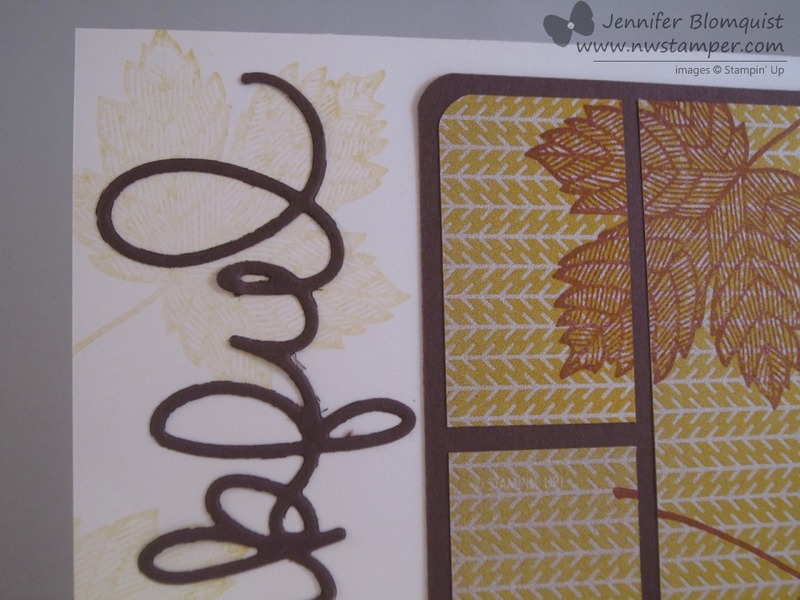 I rounded the opposite corners and then matted them with some Chocolate Chip cardstock. 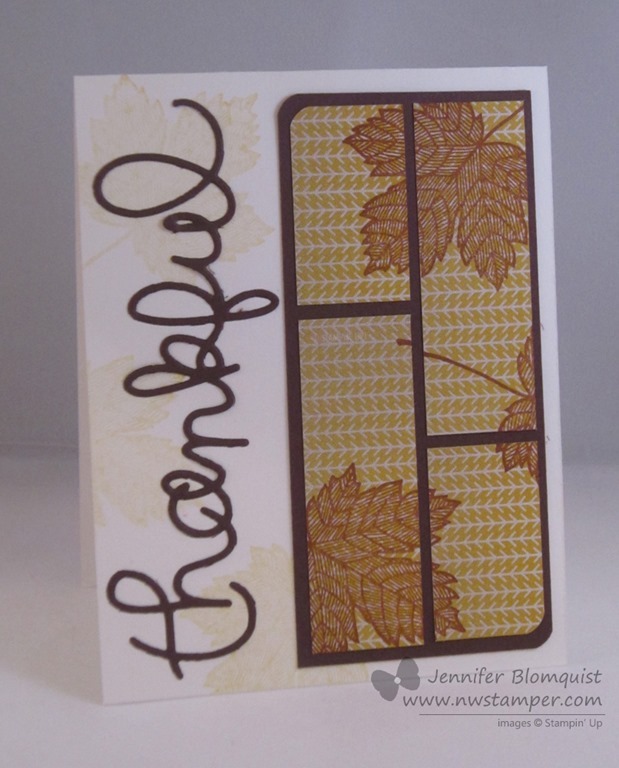 The sentiment looked a little stark on the white side of the card so I added a few more maple leaves and softened them up by stamping on some scrap paper first and then before reinking I stamped on the white paper. This gives the faint leaf impression. 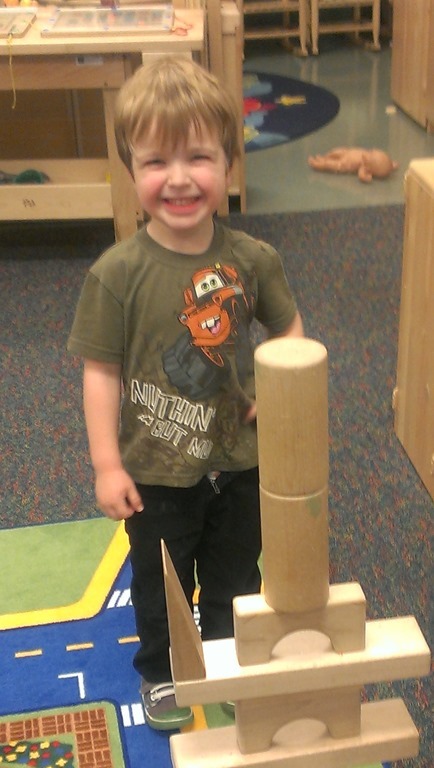 So, give them a try and have fun with all the possibilities!